The Style in SonyStyle. Sony refreshes its budget 14-inch Vaio E lineup for the New Year with WiDi, Blu-Ray and standard voltage Sandy Bridge Core i5 CPUs. But, has the Japanese giant cut any corners to reach that sub $500 starting price? Find out in this review what the new Vaio E does right – and ultimately what still needs to be done. 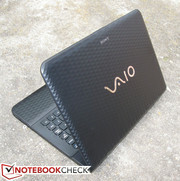 Announced in early 2010, The Vaio E Series is still relatively new to the Sony lineup of notebooks. Prior to its introduction, notebooks from Sony were mostly seen as “high-end” with fewer options for users on a budget. With the new E Series, the Japanese manufacturer is now aiming directly for budget buyers while attempting to maintain as much of the style in “SonyStyle” that can normally be found in some of their more expensive Vaio families. The 14-inch 2012 Vaio E starts at under $500 and is available in black, blue, pink or white, but the base model will leave the user with only an Intel Pentium B960 CPU and a DVD burner. The sample unit under review has been configured to be about $700 retail with a standard-voltage Sandy Bridge CPU, Intel WiDi and a Blu-Ray drive – three options not normally found on inexpensive notebooks of this size. While the Vaio E is also available in 15.5-inch models starting for around $40 less than the base 14-inch Vaio E, we’ll concentrate first on the more compact 14-inch model in this review. In terms of quality, the 2012 Vaio E is similar to the model from the year prior. Getting straight to the point, the build is plastic all around, which is expected from a notebook in this price range. That’s not to say it’s of poor quality -- quite the opposite in fact. The palm rest surfaces, keyboard, underside and edges are all taut and practically incompressible with a finger. The lid in particular is quite resistant to twists given the budget-centric nature of the notebook. The monitor hinges are overall stable enough to use on less-than-ideal surfaces where slight to moderate vibrations would normally cause unwanted shaking. As is typical of Sony products in general, the aesthetic design of this year’s Vaio E is definitely a cut above the competition. More often than not, budget notebooks can be an eyesore due to overall thick builds and unattractive designs, but the Vaio E has dodged this shortcoming with an appealing appearance. The matte surface is smooth throughout (save the duller underside) with a moderately reflective honeycomb-like texture and design. The Sony accumulates fingerprints much less noticeably than other notebooks, especially when compared to ones that have extra-glossy surfaces like the Dell Inspiron 14r. With that said, a couple of features make the Sony less than ideal in the chassis department. In contrast to the rest of the notebook, the outer center of the lid is too easily depressed with one’s fingers or palm. In addition, the overall size may be too stocky and boxy for some. The front edge of the notebook barely tapers down to thinner dimensions, so the thickness from back to front is almost identical at 1.36-inches (34.54mm) and 1.14-inches (28.96mm), respectively. This does, however, allow the user to open the lid with just one hand since the base feels solid and dense. In general, the Vaio E just cannot match the looks of the higher-end Sony offerings, but it would be difficult to find another notebook as visually refined as this Sony for the given size and price. Notebooks in this price range are notorious for having limited connectivity options, but the VAIO E thankfully includes many of the basics. Users will be able to access four USB 2.0 ports, which is one or two more than expected from a 14-incher. Unfortunately, these are bare USB 2.0 ports – there are no yellow always-on ports, no blue USB 3.0 ports and no combo eSATA parts to speak of. Furthermore, three of these USB ports are tightly packed on the front right edge where connected cables are likely to frustrate right-handed users. Still, all physical ports are evenly distanced from one another and are easily accessible since there are none available on the rear. Of course, this being a Sony product, the Vaio E naturally includes a Memory Stick PRO Duo slot in addition to a dedicated SD memory card slot and an option for a Blu-ray optical drive. A third-party card reader may be necessary for any other types of flash cards outside of PRO Duo and standard SD. Users who choose to use the notebook as a Blu-ray player should definitely take advantage of the HDMI-out port and an HDTV for the full 1080p experience whenever possible. In terms of wireless connectivity, the Vaio E comes standard with only wireless-n and WiDi 2.0. The WLAN in particular is provided by an Intel WiFi Link 1000 BGN adapter capable of up to 300Mbps throughput and is compatible with Intel My WiFi Technology. Also, the fact that there is even support for Intel’s Wireless Display technology while having no support or options for more common wireless features like Bluetooth, GPS or WWAN makes this Sony a bit of an oddball. The lack of the latter two features is reasonable as the Vaio E is marketed more as a consumer product than as a business solution, but a simple option for built-in Bluetooth would have still been appreciated. Additional extensions to the Vaio E are limited since there is no dedicated docking port, secondary “Battery Slice” support or dedicated Light Peak ports. For these options, user will have to look into the more fully-loaded Vaio Z Series or S Series. However, Sony does offer a USB 2.0 docking station compatible with all their current Vaio notebooks as a general accessory. Called the Targus USB 2.0, the unit offers additional USB ports and a DVI-out. A silicon keyboard cover, called a “keyboard skin”, is also available in multiple colors for smudge protection and a bit of spill resistance. The performance of this cover is detailed below in the Input Devices section. There is a moderate amount of preloaded software that may or may not be useful to the user. Certain programs, such as the trial edition of 2012 Norton Internet Security, are set to run in the background by default. 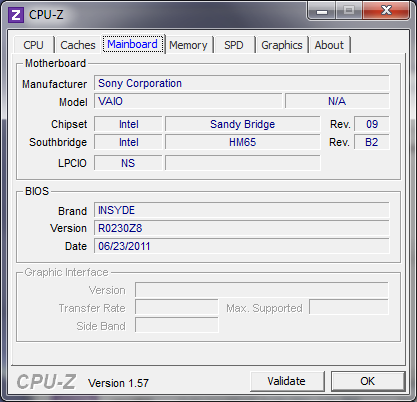 Specialized Vaio software exists as well, including Vaio Care (with recovery and restore functionality), Vaio Gate toolbar, Vaio Control Center, Media Gallery, PMB (Picture Media Bar) and even a virtual keyboard for remote access to BRAVIA television sets and Playstation 3 consoles. Vaio Care and Media Gallery can be launched directly with the dedicated Assist and VAIO buttons, respectively. Note that the remote keyboard software is essentially inoperable on the 14-inch Vaio E as the software requires Bluetooth to function. Fortunately, each program can be effortlessly uninstalled through Windows Uninstaller if the user demands. 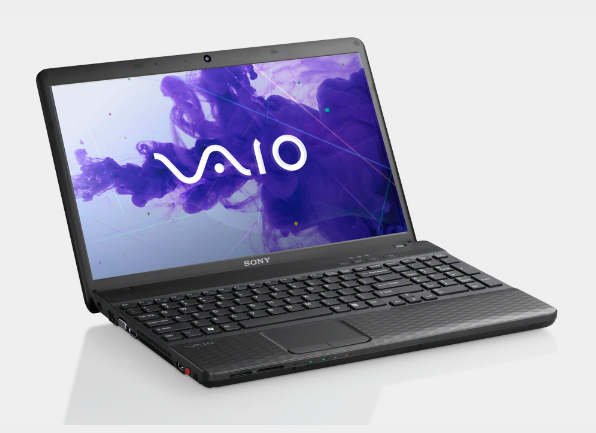 When ordered directly from the Sony online store, every Vaio notebook comes standard with Sony’s limited warranty plan and includes parts/labor support and free call support, both for up to one year. The basic plan can be upgraded to a two- or three-year Replacement Plan for $70 and $160, respectively, which allow benefits such as no shipping costs to the user, no estimates or deductibles and a “No Lemon” policy. Each Replacement Plan can be upgraded even further to cover accidental damage. The flat, non-backlit, Chiclet-style keyboard is sufficiently sized (30cm x 10.5cm) and works very well. There is ample tactile feedback as each key feels firm but still quiet when pressed. Every key is also evenly spaced, easy to reach and not too small. This stays true even down to the directional arrow keys, which are actually of equal size to the QWERTY keys. Given the limited surface area of a 14-inch notebook, Sony has done an excellent job integrating a clean layout with an easy-to-use keyboard. One of the few very minor complaints we have with regards to input keys is the lack of dedicated volume and mute buttons. Given that Sony was able to add dedicated Assist, Web and Vaio buttons, we think that adding a couple more keys directly above the Function keys specifically for volume control would have been quite useful. We were also able to test out the keyboard skin accessory, which is essentially a specialized sheet of silicon rubber with recesses made to fit directly over the entire keyboard of the 14-inch Vaio E. The covering protects the keys from normal wear and debris buildup due to everyday typing, all the while offering light resistance to very small spills. Because of its silicon and rubber structure, the thin keyboard skin is also easy to clean and carry if needed and noticeably reduces typing noise. Note, however, that this means slightly reduced tactile feedback, but the trade-off is generally nothing that the user cannot become accustomed to overtime with more use. Compared to the superb keyboard, the touchpad falls a bit short, but is still very usable nonetheless. The textured touchpad is a bit on the small size (7.50cm x 4.75m), especially if the user utilizes multi-touch gestures frequently on the notebook. Speaking of multi-touch gestures, an annoying aspect of the touchpad worth mentioning is its inconsistent transitioning between single-touch use and multi-touch use. For example, if the user has one finger on the touchpad for single-touch use, a second finger can then be placed on the touchpad for multi-touch use, which is how it should intuitively operate. But, when the second finger is lifted, the touchpad will remain “stuck” in multi-touch mode and will simply not register single-touch actions until all fingers are lifted. This issue may or may not be bothersome to certain users, but it would be ideal to have a driver update or even a software toggle to fix the inconsistency. Otherwise, the touchpad is overall responsive, although multi-touch gestures do suffer from the confined surface area. The left and right keys adjacent to the touchpad are just as responsive, relatively quiet and quite discreet, although we feel that they could have used more depth when pressed. The glossy LED-backlit 14.0-inch display of the Vaio E provides a native resolution of 1366x768 pixels, which is typical of entry to mid-range offerings in this screen size. Other 14-inch or 13.3-inch notebooks may offer higher resolutions at 1440x900 or even 1600x900 pixels such as the 2011 MacBook Air and HP EliteBook 8460p, but at much higher prices. Consequently, we were satisfied with the available screen estate, at least for everyday browsing or typing. Subjectively, text and photos appear clearly on the display with no major disapprovals. With the Gossen Mavo-Monitor, we were able to measure a maximum screen brightness of 214 nits on the center left of the screen while the notebook was connected to an outlet. We would have preferred if the display stayed above 200 nits on each of the nine quadrants tested, but at least the overall brightness is relatively uniform. Unfortunately, maximum brightness drops dramatically to only 127.1 nits on the center of the display once the notebook is unplugged. This is one of the largest changes in brightness we’ve seen as most other notebooks more typically experience drops of about 30 to 50 nits only, if any at all. Because of this, users may find themselves cranking up the brightness towards its maximum when a power outlet is out of reach. 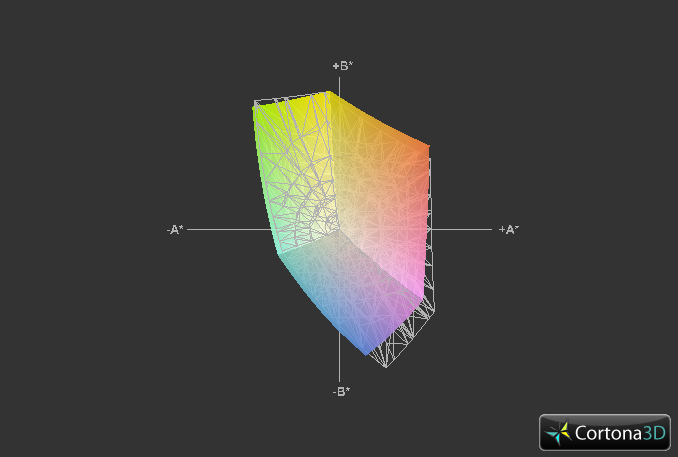 The color space reproducible by the display is modest at only about 60 percent of the sRGB standard. Granted, this is in line with many other TN displays on competing 14-inch notebooks such as the LG P420 or Toshiba Satellite P745. 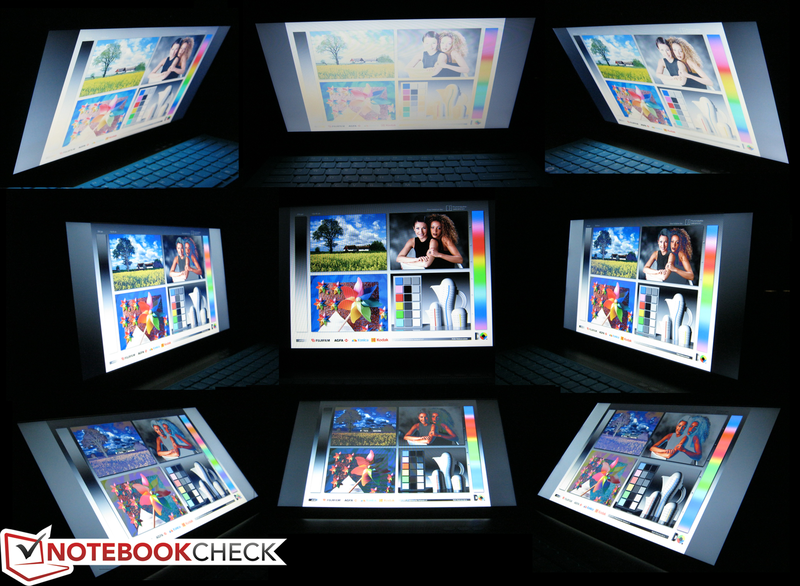 Fundamentally, users who will use the notebook mainly for web surfing or movies can generally disregard the color space performance – It’s the professional graphics artists and designers who should stay away from using the Vaio E as a primary workhorse due to their exacting demands for accurate color representation. The outdoor usability of the Vaio E is below average. The glossy display in combination with the low screen brightness both make for difficult use during long outdoor sessions. We definitely recommend turning the brightness up to its maximum if possible during these situations. 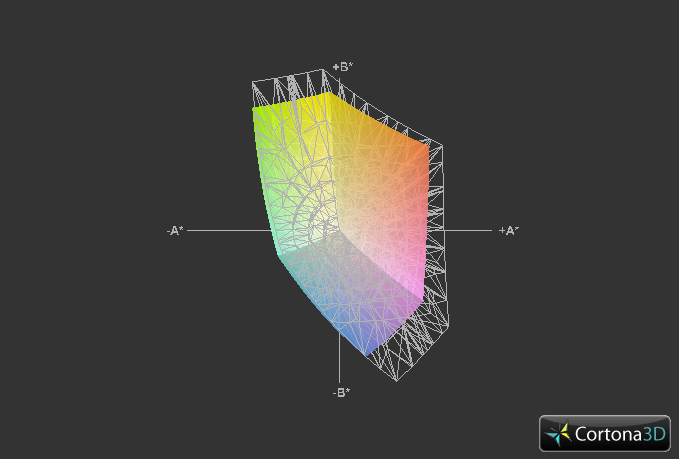 Viewing angle stability is typical of TN displays. 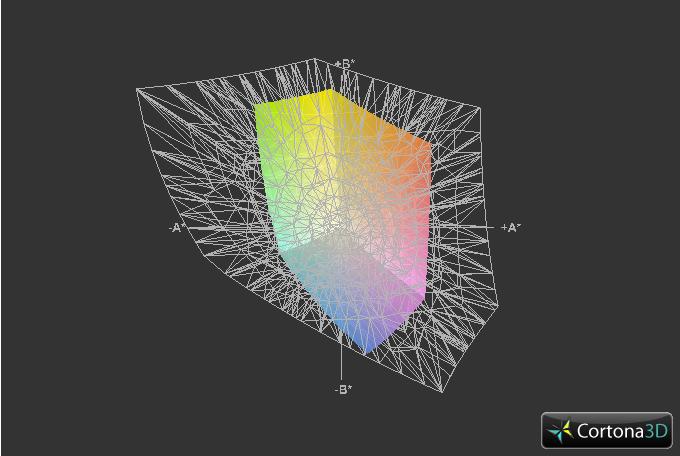 Colors invert much more quickly when viewing from angles below the normal compared to above, which can potentially make it difficult to share the screen with others during movie playback. In fact, we noticed distortions starting at about 15 degrees when viewing from directly below and about 45 degrees when viewing directly from the sides. Either way, the somewhat tight viewing angles should not be an issue for the solitary user. The unit under review is configured with a fast and relatively new Sandy Bridge Core i5-2430M CPU, complete with Hyper-Threading and 3MB of L3 cache. 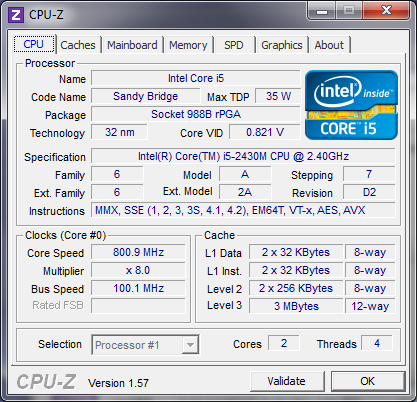 As a standard voltage CPU, the processor is rated at a TDP of 35 watts, or practically twice the potential power draw of ULV Core i5 chips such as the i5-2537M or i5-2467M. The additional current allows the Vaio E to run at a base 2.4GHz with Turbo Boost 2.0 up to a theoretical 2.9GHz on both active cores and 3.0GHz on a single active core. 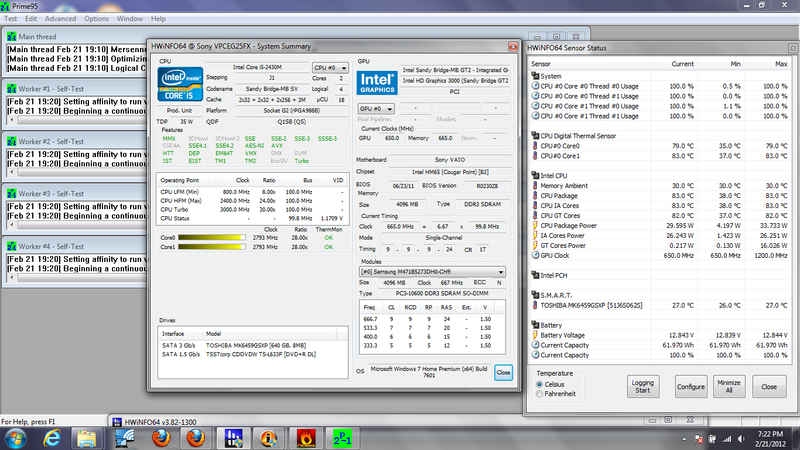 Buyers can go one step higher for a Core i5-2450M or dial down the specs to a Core i3-2350M or Pentium B960 CPU. For RAM, the Sony starts at 4GB of DDR3 provided by Samsung. Two RAM slots total are available for up to 8GB. 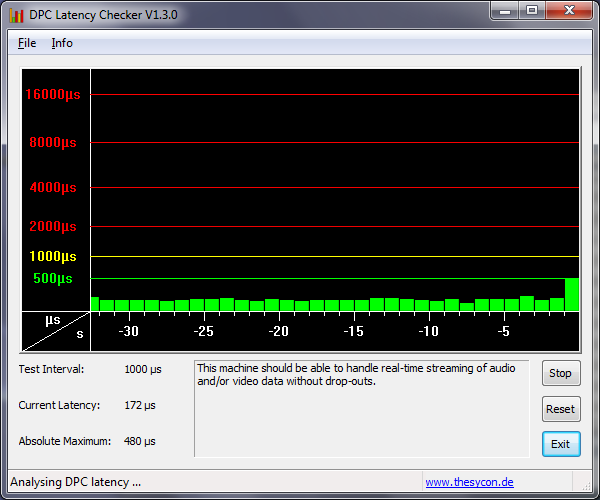 Furthermore, no recurring high latency peaks were detected with the DPC Latency checker, even with WLAN active. In the CPU-oriented benchmarks, the 14-inch Vaio under review performs better than ULV Core i5 CPUs due to its raw performance speeds and is a tad faster than the more commonly found i5-2410M in some cases. For example, the Vaio E scored 9946 points under the multi-CPU Cinebench R10 64-bit test compared to just 5127 points of the Samsung 900X3A with an i5-2537M and 7027 points of the Toshiba Z830 Ultrabook with an i5-2467M. Certain notebooks with an i5-2410M scored noticeably lower than the Sony in the same benchmark, such as the LG P420 with 8375 points, but some notebooks, like the Packard Bell EasyNote NX69, scored similarly to the Sony despite the comparatively disadvantaged i5-2410M CPU. 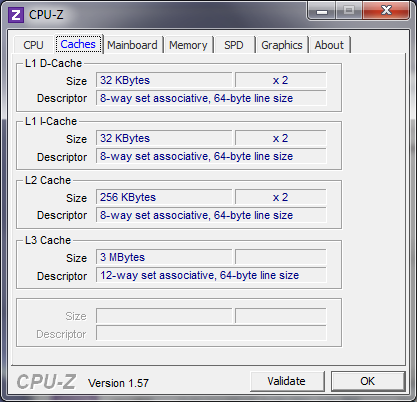 The CPU results of the Vaio E are even a bit higher than other notebooks equipped with the same i5-2430M CPU, for example the Samsung 700Z3A and, to a lesser extent, the Dell Inspiron 14z. With SuperPi and wPrime, we were able to test the single-core and multi-core performances of the i5-2530M in the Vaio E. The notebook performed well in these tests, having completed SuperPi 32m in 12 minutes 5 seconds and wPrime 1024m in 10 minutes 27 seconds. There is a small but definite speed advantage over the average i5-2410M, especially in single-core operations, at least according to SuperPi. 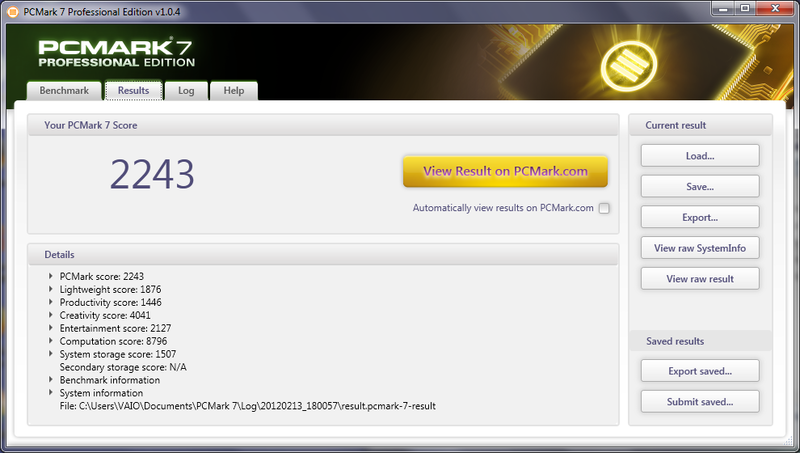 General system performance was assessed with PCMark Vantage and PCMark 7. 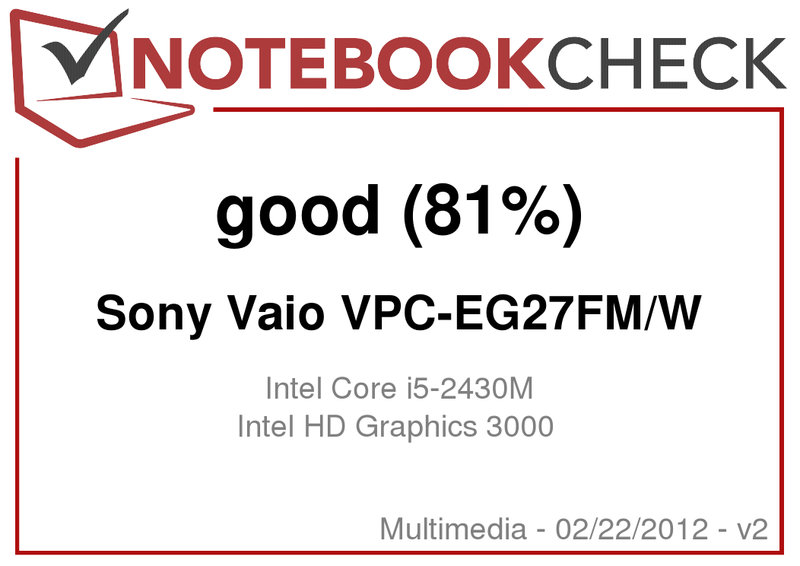 Respectively, the Vaio E was able to score 6521 and 2243 points in these PCMark suites, the former of which places the Sony in the same league as some Core i7 notebooks (e.g., Acer Timeline 8573TG with Core i7-2620M and Toshiba Satellite P775-100 with Core i7-2630QM). On the other end of the spectrum, the integrated graphics means that the Sony's 3DMark Vantage score was unimpressive at only 1644 points. In other words, multi-tasking applications is subjectively fast on the Vaio E (which can be further improved with an SSD), just don’t expect to be able to run 3D-intensive programs at their full potential. 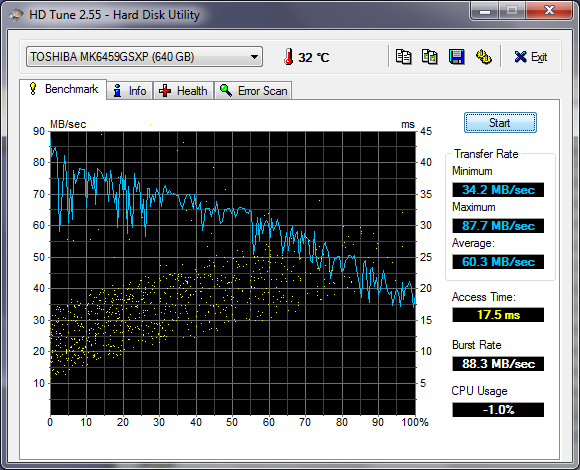 The equipped 5400RPM Toshiba recorded an average of 60.3MB/s on HDTune. This is unfortunately rather average as even other drives rated for the same rotational speed have averages closer to 70MB/s, such as the 320GB Western Digital (WD) in the Vaio VPC-CA1S1E and the 500GB WD in the Inspiron 14z. There are no options for a 7200RPM drive, meaning users will have to upgrade on their own if a faster drive is desired. Out of the 640GB HDD, 10.93GB is reserved for system restore and 585.14GB is available to the user by default. Unexpectedly, the HD caddy is rubberized in the Vaio E instead of pure metal, a much-welcomed decision. Regardless of configuration, the Vaio E comes standard with the ubiquitous integrated Intel HD Graphics 3000 (or an HD Graphics 2000 with the Pentium chip). There exists an option to include an entry-level Nvidia GeForce 410M for an additional $100 to the base price, but the dedicated GPU is still no match for many modern 3D games at even medium resolutions. In terms of gaming prowess, our test model is equipped with only the integrated Intel HD 3000. This GPU has been extensively tested and benchmarked here at Notebookcheck on numerous notebooks under an extensive list of PC games, so its overall performance is well documented. Generally speaking, the Intel chip is an underperformer in the eyes of a gamer or 3D graphics designer, but is a satisfactory video adapter for casuals who use the notebook mostly for web surfing, word processing, 480p to 1080p video playback and the occasional Flash games. See here for more information on this Integrated Sandy Bridge graphics chip. Under typical and regular use, the Vaio E stays very quiet but is always a tad audible. Not enough to be bothersome at all, but the ever-so-slight noise is perhaps unsurprising due to the powerful CPU. This is compared to slower notebooks, such as the Lenovo X121e, where fan noise when idle is practically nonexistent due to the calmer AMD Fusion APU. Similarly, the notebook is still subjectively quiet during video playback, even on 1080p. Users will notice a small increase in fan noise, but nothing distracting. Watching videos should incur no problematic background noise from the Vaio E.
As is ordinary, system noise becomes loudest when under maximum stress, such as from running Furmark and Prime95 simultaneously. We were able to record noise levels of up to 45 decibels from 15cm away during the stress test, quite loud for a notebook under 15-inches. The surface temperature of the 14-inch Sony becomes subjectively warm even when idle. This is most apparent on surfaces closer to the bottom front center, where a high of 30.2 degrees C was measured under an ambient temperature of 18.8 degrees C. But in general, normal laptop use should incur no uncomfortable temperatures. When stressed under FurMark and Prime95 for over two hours, the overall temperature of both the top and bottom surfaces increased by about 6 degrees C on average. 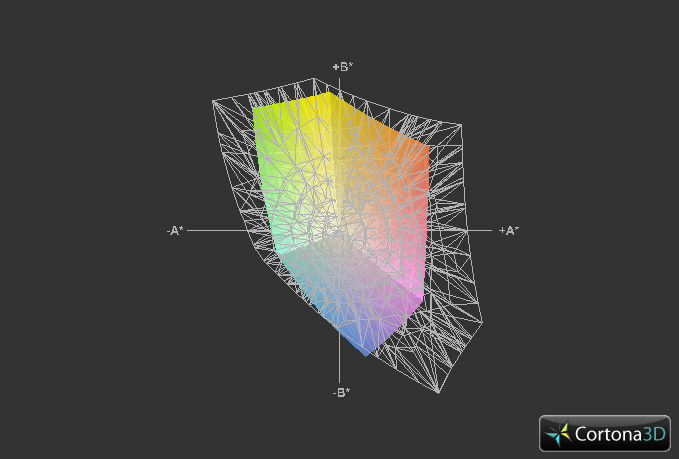 One particular quadrant underneath the notebook can become especially hot relative to the rest of the notebook. We measured a surface temperature of 41 degrees C on this particular spot compared to just 27.8 degrees C of the adjacent quadrant. 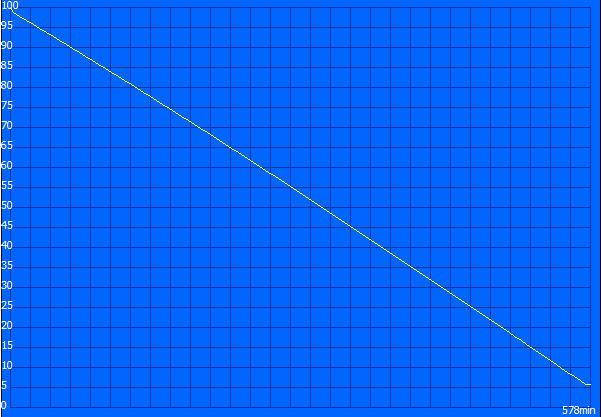 The overall temperature range is even wider when comparing quadrants nearer the opposite corner of the notebook (see image below). 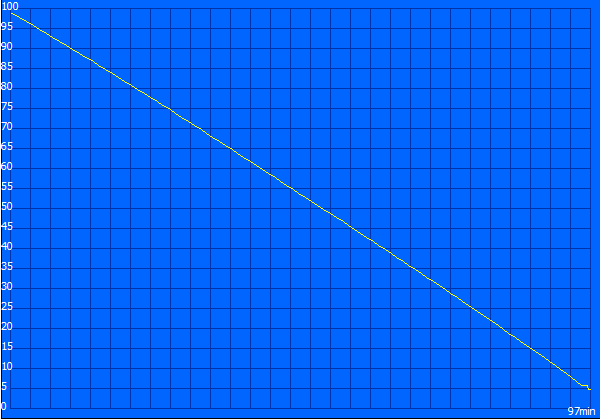 While the notebook is a bit uneven in terms of temperature distribution under stress, the test conditions here are unlikely to be reproduced during normal notebook use. Under the same stress tests, we observed no throttling issues on the Vaio E. In fact, the CPU holds its own extremely well. 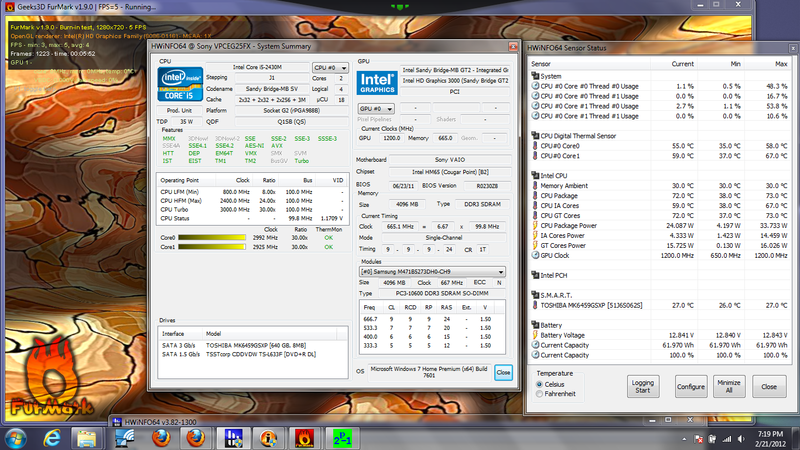 According to HWiNFO, both CPU cores and the integrated GPU are stable at 2900MHz and 650MHz, respectively. With only Prime95 running, all four CPU threads skyrocketed to 100 percent, but both CPU cores remained above 2800MHz. 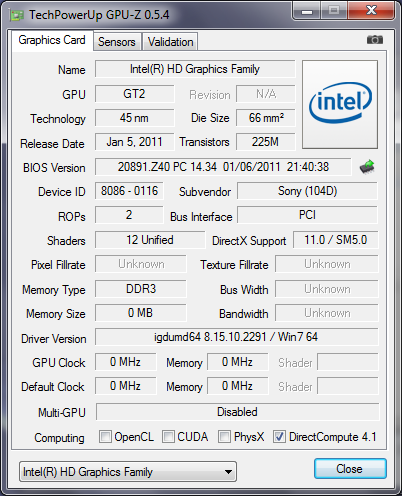 With only FurMark running, the GPU clock maxed out at 1200MHz. When both Prime95 and FurMark are active, the CPU cores quickly dropped and endured at its base 2400MHz, while the GPU clock hovered between 800MHz and 900MHz. CPU temperatures maxed out at about 88 degrees C with the system fan on full force, making us believe that higher performance could have been squeezed from the notebook if the chipset had been rated for a higher TDP or if the AC adapter allowed for higher currents. 3DMark06 was initiated immediately following the stress test to confirm any throttling issues. The final scores (GPU: 3598 points, CPU: 3274 points) were very similar to our initial scores, suggesting that throttling is a nonissue. The stereo speakers of the Vaio E lie directly above the keyboard, or more precisely, adjacent to the Esc key and Power button. Sound quality is subpar, even for a notebook this size. Sounds have little depth with a narrow range and a low maximum volume. Especially in music, bass instruments become practically inaudible. The speakers only barely get the job done; we highly recommend using external solutions for music, movies or even conferences for more distinct and perceptible audio. Fortunately, the Vaio E offers dedicated mic and 3.5mm ports instead of the usual combination port, so at least users can use headphones or external speakers and microphones separately or simultaneously. The Sony under review includes a standard user-removable Li-ion battery rated at 5300mAh and 59Wh, although users have the option to upgrade to a 7950mAh battery for an additional $70. Even without the higher capacity module, we found that the standard 5300mAh battery was able to provide a lengthy runtime under a variety of tasks. For maximum battery life, we turned to the Reader’s Test in BatteryEater, a program that simply scrolls through notepad text automatically until the notebook shuts off. With minimum brightness, WLAN inactive and “Power Saver” mode active, we were able to record a battery life of 9 hour 37 minutes. This is compared to the 14-inch Toshiba P745 and Dell Inspiron 14z with similar specs, which clocked in at 6h 6min and 10h 9min, respectively, under the same testing conditions. The minimum battery life, done with the BatteryEater Classic Test, was a low 1 hour and 36 minutes. 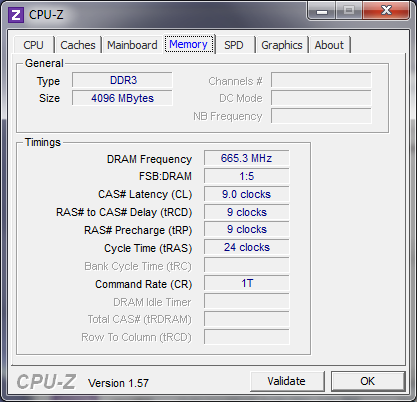 The fast downtime is to be expected, however, since the standard voltage CPU is running at a high base of 2.4GHz. 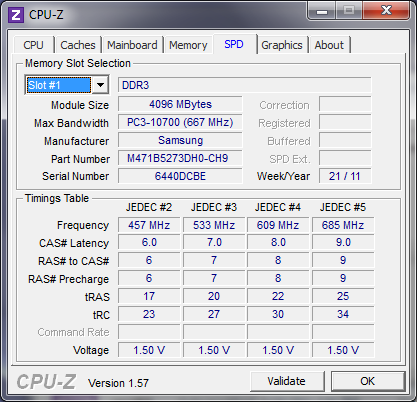 The 14-inch Inspiron 14z and more expensive Samsung Series 7, each with the same 2.4GHz Core i5-2430M CPU, both lasted under two hours on the same test as well. For a more reality-oriented test, we set the power profile to “Balanced” with 66 percent brightness and browsed the web with some occasional Youtube and Hulu videos. Under these settings, we were able to squeeze out 6 hour and 2 minutes before the 5 percent battery warning popped up. 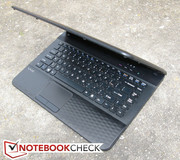 Overall, the runtime of the Vaio E can be quite lengthy and comparable to others with the same CPU. We can’t help but feel, however, that the extra low brightness of the display could be a contributing factor to its generally good battery life. Regardless, users should keep note that battery life will drop dramatically if running demanding tasks on both the CPU and integrated GPU. For a 14-incher beginning at only $499, the 2012 Vaio E makes for a great starter notebook due to its respectable build quality, excellent keyboard, good battery life and fast CPU performance for the price and size. The Vaio E won't drop any jaws like how some higher-end Vaio notebooks can, but the integrated WiDi and Blu-Ray options, not to mention its relatively attractive design, all make this particular notebook series standout amongst similarly priced competitors. Those who know that they can make frequent use of the Blu-Ray drive, WiDi technology and the speedy standard voltage CPU should find the relatively well-designed and compact 14-inch Vaio E excellent for their needs – you’ll just have to keep in mind the limited wireless connectivity options, poor speakers and darker-than-normal display. HDD and RAM can be easily accessed with a Philips screwdriver.. The proud Vaio logo sits alone - no Windows or Intel stickers! For the price, the 2012 Vaio E offers Blu-ray and WiDi with impressive CPU performance and design. The notebook holds up extremely well under stress and is more solidly built than competing budget notebooks. Connectivity features such as USB 3.0, eSATA, Bluetooth and WWAN would greatly improve the value of the Vaio E. A brighter screen with a matte option, dedicated multimedia keys and a larger touchpad are major points we'd like to see improved with next year's model. WiDi as standard with Blu-ray as an option are two features not normally found in notebooks of this size, let alone price range. The 4x USB 2.0 ports will definitely be appreciated by many, especially when 2x or 3x USB 2.0 ports have essentially become the norm nowadays for 14-inch notebooks. Vaio VPC-CA1S1E, Packard Bell EasyNote NX69-HR-127GE, Dell Inspiron 14z, Toshiba Satellite P745-S4250, LG P420-N.AE21G. 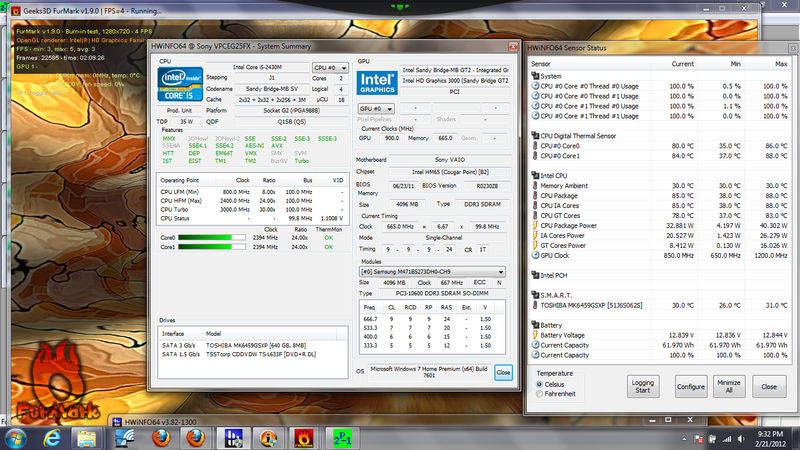 More expensive competitor: Samsung Series 7 with a similar CPU.